As our world becomes smaller, an understand of other cultures is increasingly important. At Charlottesville City Schools, we have a wide variety of language programs, whether they are designed to teach Mandarin to a native English-speaker or English to a native Mandarin-speaker. American Sign Language: ASL has been an offering in the recent past. There has not been enough interest to sustain the program. However, interested students should contact their guidance counselor so that we can gauge interest and explore the possibility of returning it to the offerings. World language courses are electives for students who wish to expand their horizons by learning another language. To meet the requirements of the Advanced Studies Diploma, students need to complete three years of one world language or two years each of two world languages. 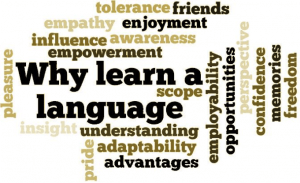 World language is also an entrance requirement for many colleges and universities. Our World Languages students and staff have a strong track record of earning international travel fellowships via the U.S. State Department and other programs. Click here for more information. Following the elementary Spanish program offered in grades 1-5, students have increasing choices as they move through Charlottesville City Schools. To see detailed information about our offerings, consult the “World Languages” section of our Program of Studies. Your school counselor or a world languages teacher can also answer questions. American Sign Language: ASL is offered online. A face-to-face class presents challenges in both staffing and in sufficient student enrollment numbers. However, interested students should contact their guidance counselor so that we can gauge interest and explore the possibility of returning it to the offerings.